(CNN) -- Dana Woldow issues a challenge to every member of Congress: "Try school cafeteria food in your district. Then see if you continue to make the same decisions about how you fund the program." "I got involved completely by accident," Woldow said. "The principal of our middle school wanted to get the soda and junk and chips out of our school cafeteria and needed a parent to help. It really wasn't an issue for me because I packed [my children's] lunch, but when I saw what was being served, I felt relieved they never asked me for money to buy it and I felt sorry for the kids who did or who had no other choice but to eat what was being served." She got involved in 2002. She said she feels her committee's volunteer efforts have made the district's meals much healthier, but she said they still have more to do. She thinks the federal government is setting the program up for failure. Congress is about to increase the amount of money it gives to the National School Lunch Program. The Obama administration asked for more than $10 billion to improve the program over 10 years. The current bill cuts that money in half. If the bill passes, districts will get about a 6-cent increase per child. Currently, schools in high-expense cities such as San Francisco get $2.74 a meal per child. "When's the last time you could get a lunch for that price?" Woldow asked. "What we need is really about $5 a child to feed them healthy food." The No. 1 meal served to children in U.S. schools is chicken fingers and French fries. Processed food is much cheaper to serve than fresh produce. A 2009 study published in the Journal of the American Dietetic Association found that 94 percent of school lunches failed to meet the U.S. Agriculture Department's regulatory standards. None of the schools met the sodium benchmark, based on the 2005 dietary guidelines. One in five schools served lunches that met the total fat standard. It's no wonder, then, that another study from 2009 that looked at children who participated in the National School Lunch Program found they were more likely to gain weight than other children. From its beginning, the National School Lunch Program has been woefully under-funded, according to many school food experts. While the federal government mandates schools that receive federal money serve a free lunch to children whose families meet a certain income, the funds don't cover the entire cost of the meal. So, state governments or local school districts make up the difference. "Which of course is a problem, because every dollar that has to be supported by the general fund is a dollar out of the classroom," said Ed Wilkins, the school nutrition director for the San Francisco Public Schools. Wilkins joked that around school his nickname is "Mo Money." But without it, no matter how much he wants to serve children healthier food, it's tough. "But not impossible. I do think we've done a lot with this program with very little." San Francisco has radically transformed its meal service. When Woldow started observing what kids were served in 2002, she was shocked. "In the school cafeteria you could buy soda, potato chips, snack cakes, corndogs, French fries, apple turnovers, ice cream --you know, carnival food," she said. The popular wisdom at the time was if a school stopped serving these empty-calorie foods, the cafeteria would lose money and the district wouldn't be able to make up for the gap in federal funding with those profits. Woldow wanted to test that theory. She did an analysis of the budget. "What we found out was our cafeteria had actually been operating in the red even selling soda and potato chips hand over fist," she said. So, they launched a pilot project at one middle school. It eliminated the junk food from the a la cart program and removed it from the vending machines. Instead they sold freshly made deli sandwiches, salads, soup and even sushi. "Three months after we started our pilot project, the cafeteria was breaking even. Six months into it, our cafeteria was one of two in the school district that turned a profit. So much for the idea that you will lose money if you stop selling junk food in your cafeteria," Woldow said. The next year they expanded the program to every middle and high school. Based on the program's success, the school board passed a resolution to remove junk food by the start of the 2003-2004 school year. Today, many of the public schools in San Francisco have salad bars. Fresh fruit and vegetables are available at every school daily. Healthy snacks such as baked chips, low-fat crackers and fruit snacks are in the vending machines. White bread is gone. Whole grain bread and wheat pasta are on the menu. The entire district also is trans-fat free. "We have been able to bring in fruits and vegetables, but it's been a costly project," Wilkins said. "As it is, there is a desire to have an even better program here, but there's such funding limitations there is an absolute limit on what we can achieve." Most of the schools in the district lack kitchens, so they must buy pre-produced food from off-site. Most of the vegetables they use are frozen. While hundreds of farms are nearby, the district can't afford to buy organic produce. "Schools shouldn't have to choose between meeting their children's academic needs and meeting their nutritional needs," Woldow said. "We need a higher reimbursement -- 6 cents isn't going to do it." "We found money for small businesses. We found money for small banks. We certainly should find money for small kids," said Agriculture Secretary Tom Vilsack, who oversees the National School Lunch Program. While the funding in the current bill is less than the Obama administration asked for, Vilsack vows that his department will do everything it can to help schools do the best with what money they are given. He said when he was asked to take the job as head of the Department of Agriculture, the first thing President Obama asked him to do was to improve the country's school meal program. 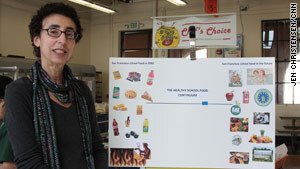 Dana Woldow says she learned schools won't lose money if they stop selling junk food. "We need to do a better job improving access and improving the quality of those programs," Vilsack said. The Obama administration has launched several high profile initiatives to improve school meals. The "Chefs Move to Schools" program launched by first lady Michelle Obama from the White House lawn calls on chefs to adopt schools and work with teachers and school nutrition professionals to help educate kids about food and nutrition. The "Recipes for Healthy Kids" is a recipe competition to encourage participants to develop healthy and delicious meals that meet nutritional requirements. Winners will be invited to prepare these meals alongside White House chefs and their work will be published in a Recipes for Healthy Kids cookbook. The "Healthier U.S. School Challenge" recognizes schools that participate in the National School Lunch Program that have created healthier school environments through promotion of nutrition and physical activity. School food advocates said they like the extra attention these efforts bring to the issue of school food, but they worry it's not enough. "A lot of the programs the USDA sponsors are based around the idea that every school cafeteria has a kitchen. Well, here in San Francisco, like a lot of school districts in this country, we don't. We haven't cooked in our elementary schools in more than 25 years. You can talk all you like about chefs moving to schools and sharing their expertise and that would be great, but we don't have any place for those chefs to cook. And you can have kids developing recipes from scratch with dark green leafy vegetables and that's wonderful, but where are these recipes going to be cooked if there is no kitchen?" Vilsack said schools are going to have to be creative. "It's up to all of us. It isn't just up to government. The reality is everybody needs to be engaged in this," he said. "It's no one's fault but it's everyone's opportunity. If you make it a priority we will respond at USDA. Parents will respond and school districts will respond. We're already beginning to see that we will have to be creative about it. There's nothing we can't do in this country if we make it a priority." "Maybe we've gone as far as we can go in the absence of proper federal funding," Woldow said. "We can't afford the organic sustainably raised apple, but the fact is we have an apple and not an apple turnover and that's how we measure progress."